A shocking report illustrates a serious problem in China: when pedestrians are hit by cars across the country, many of them don’t live through the experience. According to a report from Slate, some people are running over pedestrians multiple times to make sure they’re dead. “Stop! You’ve hit a child,” the girl’s grandmother exclaimed. However, the BMW backed over the child again in response—and then a third time, apparently to make sure the girl was dead. “Don’t say that I was driving the car,” the driver said. The report said that Chinese media is filled with similar reports, and it’s referred to a “double-hit,” meaning that drivers purposefully roll back over a victim to ensure death. Chinese law makes it cheaper to actually kill a person with a car than to injure them. When someone is killed, the accused pays a series of fees that amounts to approximately $30,000. But if they injure someone, the law indicates the victim has to be taken care of for life, which can cost millions. As the report notes, getting out of murder charges is also pretty easy in China. Drivers are confident they can bribe local officials or hire a lawyer to get out of murder charges. In Sichuan province, an enormous, dirt-encrusted truck knocked down a 2-year-old boy. The toddler was only dazed by the initial blow, and immediately climbed to his feet. 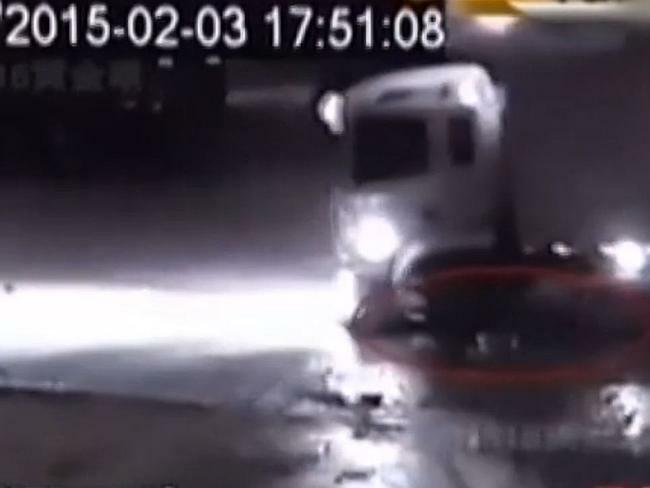 Eyewitnesses said that the boy went to fetch his umbrella, which had been thrown across the street by the impact, when the truck reversed and crushed him, this time killing him. In a recent incident, CCTV footage showed a woman repeatedly running over an elderly man who had fallen in the snow. And in May, a truck driver was caught running over a young boy four times, according to News Ltd.
Road safety remains a major issue in China. State-run Xinhua, a Chinese Communist Party mouthpiece, reported that in 2012, poorly maintained roads and bad driving habits resulted in 70,000 deaths and 300,000 injuries each year. In an environment as chaotic as this, many motorists believe they can get away with murder.